Place 2 tablespoons of GrapeOla® Oil in a large pot. Add in minced garlic and leeks. 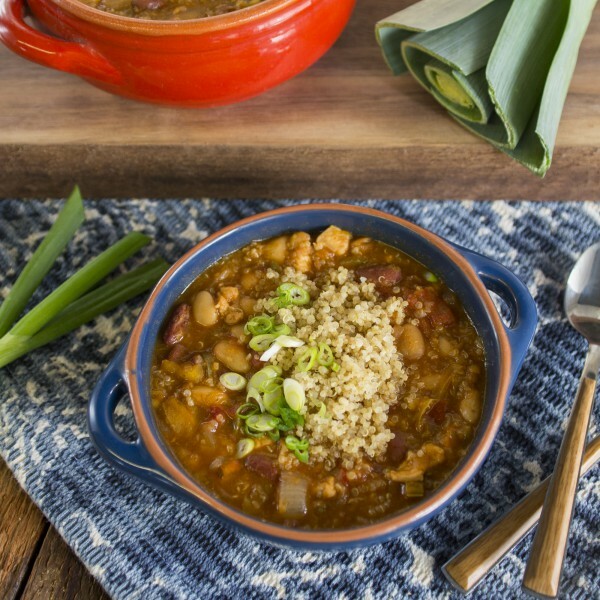 Sautee for 2 minutes until the leeks begin to soften, then add in chicken breast, ecoLife® quinoa, chicken broth, beans, and chilis. Bring to a boil, uncovered. Let simmer and cover for 30 minutes on low until chicken is cooked. Remove chicken from pot and shred with 2 forks, then return to the pot and stir. Add in cumin, salt, lime juice, and fresh cilantro and stir to combine. If your chili is too thick (it tends to do that!) add more chicken broth or water. If the chili is too thick, add water or stock until to meet desired consistency.